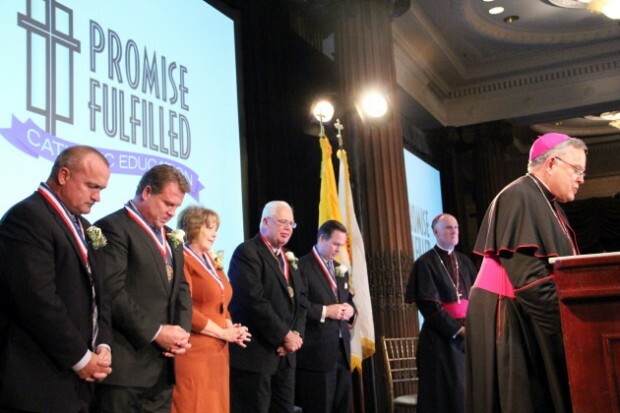 The Archdiocese of Philadelphia honored five Catholic school graduates with its 2012 Distinguished Graduate Award, also known as the Archdiocesan Hall of Fame, on Oct. 11. The event honors Catholic school alumni who have not only achieved professional success in their chosen fields, but also demonstrate a commitment to living their lives by the Gospel values that guide and define Catholic education in the Archdiocese. Bishop Michael Fitzgerald presented the honorees with their awards. The emcee for the evening was Bob Kelly, CBS 3 traffic reporter and graduate of Northeast Catholic High School. Archbishop Charles J. Chaput, O.F.M.Cap., offered remarks as well as the final prayer. Philadelphia Mayor Michael Nutter also attended to congratulate the honorees. Guests were entertained by the 20 members of the All Catholic Jazz Band under the direction of Matthew Schwartz. Rachel Campana, a student at Archbishop Wood High School in Warminster sang the National Anthem and Collin McDonald, a student at Bishop Shanahan High School in Downingtown, performed on the piano. Growing up as one of 12 children, all of whom attended Catholic schools, Chambers found the faith-filled teachings he learned in the classroom always reinforced at home. With the foundation set in his elementary years at St. Anastasia’s in Newtown Square and secondary school at Cardinal O’Hara, Tim looks to his Catholic education as setting the stage for his career in media. Today, Tim is an experienced entertainment executive who has spent over 20 years in the film, television, and technology industries-and has made it a mission to incorporate the Catholic faith into his work in a favorable light. Most notably he wrote, produced, and directed The Mighty Macs. Along with many other accolades and successes, he is also the Founder and CEO of both the Quaker Media Group and Tango Traffic, both located in Malvern, PA and Los Angeles, CA. Tim lives with his wife, Kathleen, and their three sons in Media, PA. Since the very first year he attended Saint Andrew Elementary School in Drexel Hill, Gerard Cuddy’s perspective on life had begun to take shape. He comes from a long line of Catholic school graduates, the value system and gospel teachings learned in the classroom were always reinforced at home. The desire to pursue a faith-filled education led Gerard to go on to attend Monsignor Bonner High School, earn an undergraduate degree at Villanova University, and complete a Master’s degree at Saint Joseph’s University. As the President and CEO of Beneficial Bank, Gerard finds himself taking an extra five minutes for prayer or reflection before making large business decisions-an exercise learned early in his educational years. A member of Our Mother of Good Counsel parish, Gerard currently resides in Rosemont, PA, with his wife and children. At a very young age, Jim Hirschmann learned that Catholic faith and Catholic education went hand-in-hand and that everyone from parents and teachers to priests, sisters, and coaches played an integral part in fostering faith-filled students. An active member of his parish’s CYO program, Jim loved playing basketball, baseball, track and any other sport he could get involved in. He also spent his time serving as an altar boy and singing in the choir. It’s no wonder that now, as President and CEO of Western Asset Management Company -one of the world’s largest investment managers – Jim still lives his life with excellence grounded in faith. For you see, what sets Western Asset apart from its competitors are several tenants of Jim’s Catholic upbringing: a nurturing environment, mutual respect and responsibility, discipline, and high expectations both in and out of the office. Jim currently resides in Pasadena, CA, with his wife, Laura, and their two children. Jane Metzler grew up in Ardsley, Pennsylvania. Her Catholic education journey began at Queen of Peace elementary school, where she had her first encounter with public speaking after being called on by the Archbishop at confirmation. 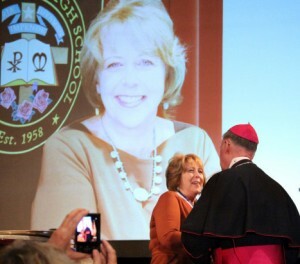 Jane went on to attend Bishop McDevitt High School, where she was a proud member of the school’s speech and debate teams and served as Class Chairman for three years. The confidence and knowledge she gained from her experiences in high school eventually lead to a successful career in broadcast journalism. As an anchor for Fox News Radio, Jane looks back at her time at McDevitt with fond memories and sincere gratitude. Jane currently resides in Hawthorne, New Jersey, is an active member of Saint Anthony’s parish and an enthusiastic advocate of Catholic education. Since his days attending Saint Martin of Tours parish school in the Oxford Circle section of Philadelphia, Brother Richard Kestler has always had a passion for education. Even after graduating from high school, completing his undergraduate studies, and earning two master’s degrees, Brother Richard still spends every day in school. As President of West Philadelphia Catholic High School, he continues to share his passion for faith and learning with future generations of students. Brother Richard always had an interest in teaching young students, but it wasn’t until he was strongly influenced by a handful of Sisters, Servants of the Immaculate Heart of Mary and Brothers of the Christian Schools that he decided to become a member of the Christian Brothers himself, – something he has enjoyed for every minute of the past 52 years.